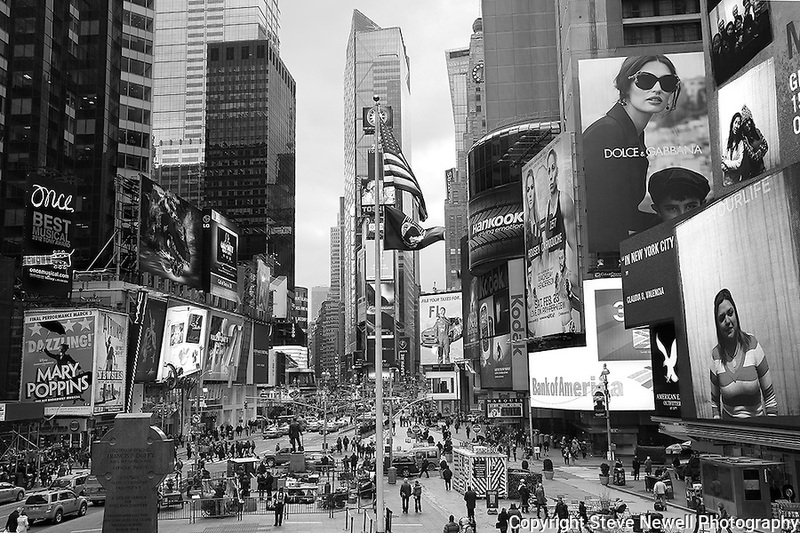 "The T Square" Black and White Times Square Manhattan New York. Times Square is like a little city all to itself that provides plenty of entertainment, bars, restaurants, shopping and attractions for everyone. You can't possibly do and see it all in a one week vacation. I went to two Broadway plays and one off broadway play while I was staying in Manhattan for eight days shooting photography. The local employees recommended their favorite restaurants and bars in the area that were excellent and affordable. Times Square has so much to offer everyone from all walks of life will be satisfied on a visit to the must see district. I made several trips to the area spanning morning noon and night- to late night. When the huge storm blew into New York on the weekend I found myself in the middle of Times Square alone enjoying the light snow fall. A memory I will cherish!